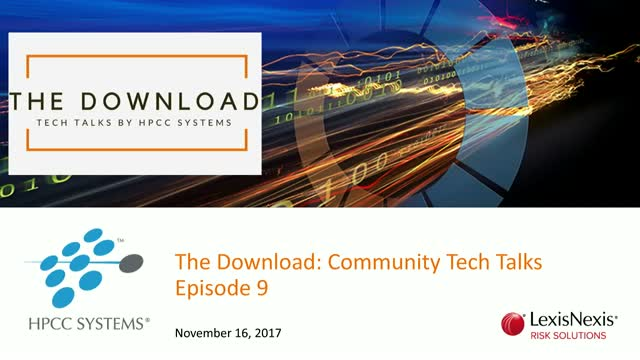 Join us November 16 for another episode of The Download: HPCC Systems Community Tech Talks! This series of workshops is specifically designed for the community by the community with the goal to share knowledge, spark innovation, and further build and link the relationships within our HPCC Systems community. Robert Pelley, Architect for UK and Ireland, LexisNexis Risk Solutions - Integrating REDIS with HPCC Systems in high volume UK infrastructure. REDIS (REmote DIctionary Server), an in-memory caching technology will be integrated into the LexisNexis application stack to provide an additional cache at the entry point of the application infrastructure. This will serve as a cache of Product Responses whereas existing caches will continue to serve Vendor Responses. The aim of the REDIS front-end Product Response cache is to improve system throughput and response times. Bob will be talking about the ECL Code Generator, DataGen, best practices and tips for its use in generating random data and will walk through a short demo. Episode 12 includes Tech Talks featuring speakers from our community on topics covering exploratory data analysis, geospatial solutions and ECL Tips leveraging the HPCC Systems platform.